On Wednesday 6th March I followed a suggestion of Chris Elliot and Margaret Sheard from cyprusscene.com to have an interview with an interesting young lady, Yuliya Skripko. 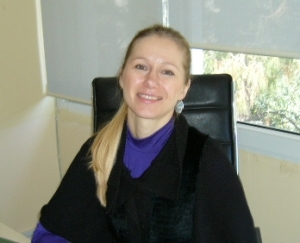 I met her in her office in the premises of the newspapers Cyprus Observer and Russian Observer. school there and after that she studied at the University of Minsk. Her fields of study were widely dispersed – Advertising, Photography and later International Relations and Diplomacy. At the moment she is completing her education at Girne American University with the Master of Business Administration (MBA) Diploma in Marketing. During her studying time in Minsk she travelled to several destinations worldwide and had employment there, because in her own words beginning from her childhood she was crazy for travelling and always wanted to learn more about foreign lifestyles and cultures. So Yuliya feels herself a Cosmopolitan and “wants to hug to the whole world”. 4 years ago Yuliya came to Northern Cyprus because she met a Turkish Cypriot man in Belarus and followed her heart. Over the years North Cyprus has become a second homeland for her and also her 5-year-old son. Her son is growing up multilingual and attending a Prep School in Girne, he already speaks 3 languages – Turkish, Russian and English. 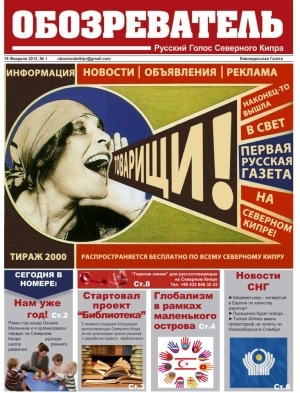 Observer), the first Russian newspaper in North Cyprus. I told Yuliya about my feeling that most members of the Russian speaking community over here want to be among their peers and do not mix with expats of other countries. She answered that the main reason for that may be the language barrier, a lot of Russian people didn´t have the ability to learn the English language. Asking her what we can do to improve this situation and bring the communities closer together, she said we have to plan common events. The Russian speaking expats have had and will prospectively have a lot of social events, the same with the British and the Germans, it´s our task now to inform each other and let us understand each other’s cultures and lifestyles. If there could be more energetic and committed people like Yuliya this task shouldn´t be too difficult! Editors note: please see the slideshow of pictures featuring Yuliya and her international friends at events supported by the Obozrevatel, Russian Observer. Thanks also go to Dasha Denisova for sharing her friend, Nikita Turovsky’s Youtube video link of the International Forest of Friendship event that was held in Çatalkőy recently. Thank you, Michael for your comment, you are completely right, peace and understanding makes the world a better place!